On Friday, November 9, Concordia University Wisconsin welcomed over 150 male students of color from Milwaukee area high schools to the inaugural College Readiness Summit. Hosted by CUW’s Black Student Union (BSU) and the School of Education, the summit was designed to demystify the college experience and application process so more young men of color consider college as an option. Students came from Kingdom Prep Lutheran High School, Riverside University High School, and Nathan Hale High School to meet with university leaders and learn successful student strategies. 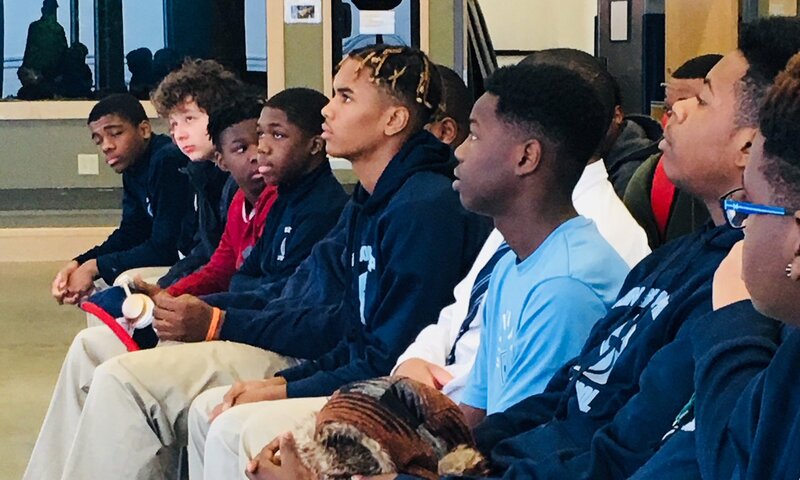 The schools and the chaperones were intentionally selected with a goal of creating a network of students and high school faculty/administrators who share a common interest in building a college bound culture among Milwaukee’s male high school students of color. 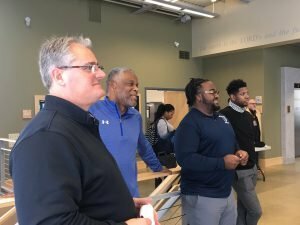 Basketball Coach Shawn Cassidy and Football Coach Adam Walker meet with Will Turner, dean of students at Kingdom Prep Lutheran High School, and Charles Smith, director of operations at Kingdom Prep Lutheran High School. Plans are underway for a College Readiness Summit designed for female students of color in spring. For more information, contact Eugene Pitchford at Eugene.PitchfordIII@cuw.edu.